The joint venture of Estonia, Latvia and Lithuania, RB Rail AS, has announced a procurement for the design and design supervision services for the second stage of the Rail Baltic railway line in Estonia from Tallinn to Rapla, reported LETA/BNS. A total of 10 international consortiums have qualified for designing the Estonian section in the second stage of the procurement, including design and engineering companies from the Baltic states as well as from other European countries, RB Rail said. The scope of the procurement for this section of the railway includes preparation of the master design for construction of the railway track substructure, superstructure, related civil structures as well as development of the value engineering studies, spatial planning solutions, detailed technical design and author supervision. The second stage of procurement for the section Vangazi-Salaspils-Misa in Latvia was also announced, for which six tenderers qualified. "Both railway sections in Estonia and Latvia include a large number of infrastructure elements, some of which, for instance the bridges over Daugava and the viaduct over the Tallinn-Rapla road, involve a very high level of complexity. For that reason, we are very pleased that the tenderers have extended experience in building large infrastructure projects, which have required facing similar challenges," Mart Nielsen, chief technical officer of RB Rail AS, said. The length of the Tallinn-Rapla section is 48 kilometers, and the section will include 24 viaducts and 4 ecoducts. 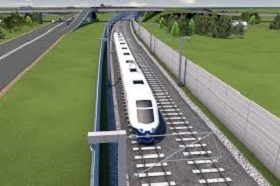 The length of the Vangazi-Salaspils-Misa section is 64 kilometers based on the preliminary draft, the section is to include 33 viaducts, as well as connections with the Salaspils intermodal logistics center and the planned infrastructure maintenance station in Vangazi. The section will also have 11 bridges, including one the project's most notable structures in Latvia -- a roughly 1.3-kilometer bridge over Daugava River. Tenders for the section in Estonia are to be submitted by Feb. 13 and those for the section in Latvia by Feb. 19. By now, seven of the 11 planned detailed technical design tenders have been announced, covering 57 percent of the full length of the Rail Baltic railway. In Estonia, procurements have been announced for the entire length of the railway from Tallinn to the Estonian-Latvian border. In Latvia and Lithuania, two procurements out of a total of four in both states have been initiated. RB Rail AS is the central coordinator for the Rail Baltic project. RB Rail shareholders include the Lithuanian, Latvian and Estonian railway companies, UAB Rail Baltica Statyba, SIA Eiropas Dzelzcela Linijas and Rail Baltic Estonia OU. The Rail Baltic project provides the construction of a new fast conventional, European standard gauge double track electrified railway line from Tallinn to the Lithuanian-Polish border.